I need a mayonnaise that will not break or melt in hot applications. Best Foods Mayo Magic is the right choice for hot application, up to 200⁰C. 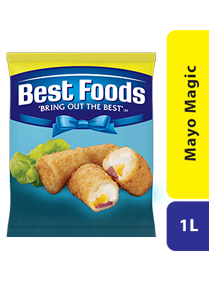 Best Foods Mayo Magic is made to give consistent yield for dish applications that need high temperature such as Stir frying, filling, baking, decorating. Even when heated up to 200℃, it remains stable without oil separation. Hence, keeping the ideal color and texture of the dish and at the same time bring out its rich taste. Formulated for hot application, Can withstand heat up to 200℃. Keep in cool and dry place. Keep in chiller at 4°C - 10°C after opening. Don’t freeze it.